(SitNews) - The annual volume of water from melting glaciers has begun to drop in almost half the 56 large river basins investigated in a recent study, a trend that the authors say will expand to other basins and affect water supplies across the globe. 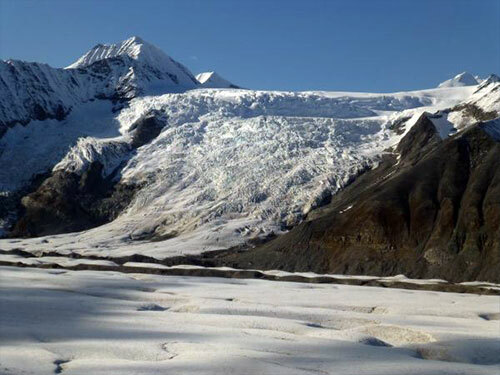 Research conducted by Regine Hock of the University of Alaska Fairbanks Geophysical Institute and Matthias Huss of ETH Zürich in Switzerland projected changes in glacial runoff for the 56 basins through the year 2100. As glaciers around the world melt, they first provide more water to their river basins. But as the glaciers become smaller and smaller, the glacier runoff decreases. A glacial icefall spills through a steep valley in the Alaska Range, home to thousands of glaciers covering an area of roughly 13,900 square kilometers. The 56 large glaciated basins studied by Hock and Huss cover more than a quarter of the Earth’s land surface and are populated by nearly one-third of the world’s population. The researchers found that almost half of these basins have already passed their maximum annual runoff — or “peak water” — which means that their runoff is already decreasing. The other basins — ones with larger glaciers or that have greater ice cover — will experience peak water later. One-fifth of the basins will not hit peak water until after 2050. The declining runoff could affect freshwater availability, hydroelectric power and ecosystems, even in basins with low ice coverage. Huss and Hock reported that, in the worst case, over the course of the next 82 years the total volume of glaciers will decrease as much as 74 percent. Even the best case shows a 43 percent decrease. They also showed that by the end of the century, a third of the basins may have a loss in runoff of 10 percent or more in at least one month of the melt season. Central Asia and the Andes mountain range have the greatest declines. Alaska is different. Monthly glacier runoff in the state is projected to increase in almost all cases during every melt season month — as opposed to only in June in many other regions. The projections also show that Alaska’s peak water probably won’t occur until later in the century. Even as glaciers retreat, in Alaska, there is still so much ice left that glacial runoff continues to increase as the melting rate increases. Because of this, water shortage is not a problem for Alaska’s large drainage basins, according to Hock. However, she said, it may lead to increased chances of flooding. Hock and Huss published their paper, “Global-scale hydrological response to future glacier mass loss,” on Jan. 22 in the journal Nature Climate Change. This article is provided as a public service by the University of Alaska Fairbanks’ Geophysical Institute in cooperation with the UAF research community.